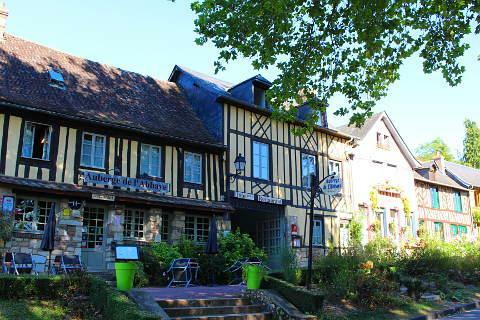 The village of Le Bec-Hellouin is situated about 40 kilometres south-west of Rouen, in the gently rolling pastoral countryside of the Eure department of Upper Normandy. This picturesque village is classed among the 'most beautiful villages in France' and well known for the substantial Abbey of Bec-Hellouin. The name of the village derives from the stream that passes the village (stream = bec) and the 11th century founder of the benedictine abbey, a knight called Herluin. 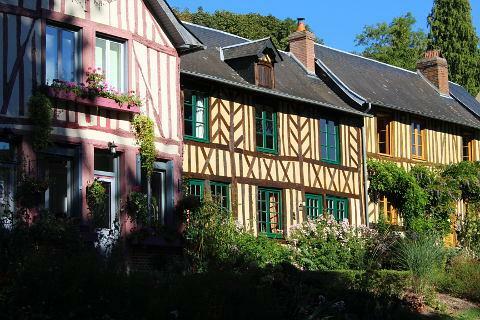 The village centre is very picturesque with a good number of colourful painted half-timbered houses to admire - very photogenic! You can get a map from the tourist office highlighting the main sites to see in the village. William the Conqueror Square at the heart of the village is surrounded by colourful half-timbered houses. 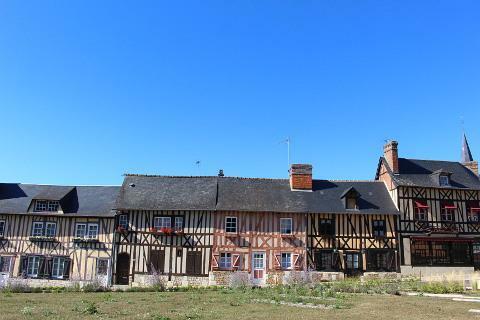 The Auberge de l'Abbaye is one of these and was once a posting house and rest stop for visitors and pilgrims arriving in horse drawn carriages. 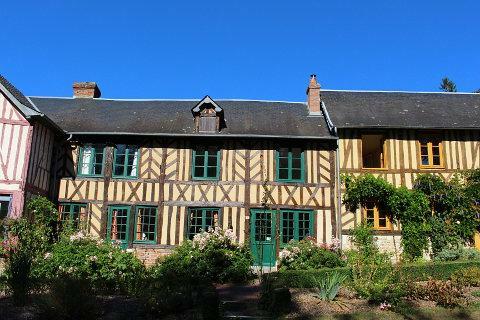 A little further down the village is this imposing 15th century house with a brick and stone check lower floor and half-timber upper floor. 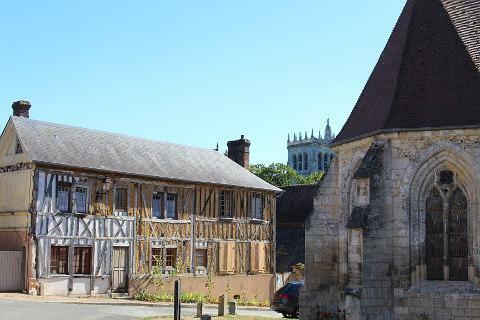 The Church of Saint-Andre in the village has its origins in the 11th century but the original church burned down and was rebuilt in the 12th century only to be damaged again during the Hundred Years War. As a result a significant part of the church we can visit today is an 18th century reconstruction, and the windows are colourful replacements added in the 1950's after the original windows suffered bomb damage during the Second World War. Inside the church you can see various items that were brought here from the abbey church when it was destroyed at the beginning of the 19th century. Behind the church is the Abbot Herluin Square and the entrance to the Abbey. Opposite the Abbey entrance is a charming row of half timber cottages dating from the 17th century. The large grassy area used to be used once a year by a travelling theatre group who would visit for one month putting different performances on each week. You will notice that one of the roads off the square is called the Rue de Canterbury named after Canterbury in England because several Abbots from Bec Hellouin Abbey became Archbishops of Canterbury! House number 13 on the street has an overhanging first floor. This reduced rent costs as payments were based on ground floor area and also protects the wooden timbers from the rain. Place Mathilde in the village is named after William the Conqueror's wife who was buried here in the Church of Saint André. Her body has since been moved to the Abbey in Caen which she founded. There was once a railway line running between Evreux and Le Bec Hellouin. This is now closed but the line has been turned into a 'voie verte' or green route, a 40 km route for bikes or for walking with lots of picnic spots along the way. The route starts at the old train station. The abbey was founded in the first half of the 11th century and at that time the influence of the abbey exceeded that of the better known abbeys such as the abbey at Jumieges. This was largely due to highly reputed monks such as Lanfranc being based here, and attracting an audience of devotees from all across Europe (in particular from England). This period was to come to an abrupt end with the Hundred Years war, during which the English seized the abbey. The building was damaged as a result of the war and substantial rebuilding was required in the late 15th and early 16th centuries, and the cloisters added in the middle of the 17th century. The belltower - the Saint-Nicolas Tower - was built in the 15th century and is the oldest part of the original building that remains, with most of the surrounding buildings being additions from the 17th and 18th centuries. 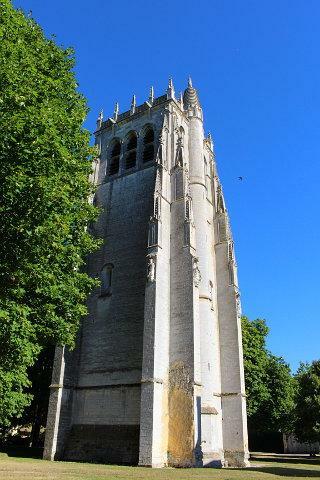 On the outside of the square tower you can see some statues of saints, and it is possible to ascend the stairs in the tower to a terrace that overlooks the surrounding village and buildings. You can also see the ornate stonework and carvings in the cloisters and around the entrance to the original abbey church. The remaining parts of the abbey are quite extensive and typical of 18th century architecture. Following the French revolution the abbey, as with all such communities in France, was closed down. The following period saw the abbey suffering by its use as a local quarry - hence there is now little of the original abbey church except its foundations. 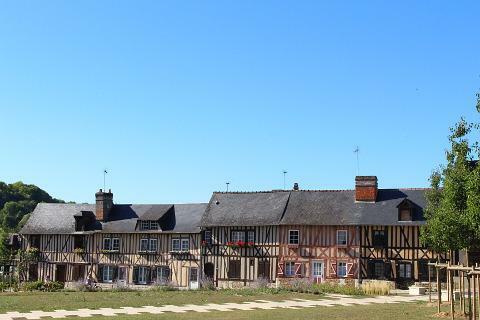 A happy ending: since 1948 a community of monks have re-established themselves in Bec-Hellouin Abbey and created a new church in the original abbey refectory. The presence of the monks also adds a special atmosphere to a visit. The Abbey at Bec-Hellouin is one of less than 100 listed National Monuments in France. 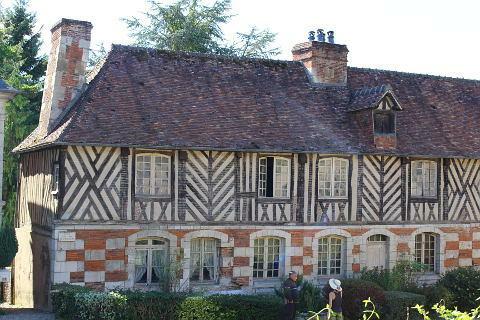 During a visit you can explore at your own pace or take a guided tour (French only). Le Bec Hellouin has had a turbulent history. In 1034 a knight called Herluin returned to his land and decided to become a hermit. In 1060 construction of the Abbey began and labourers built homes and a church too. In 1418 during the Hundred Years War the monks from the Abbey destroyed the village to deter the English invaders. This didn't work and the English troops occupied the village. 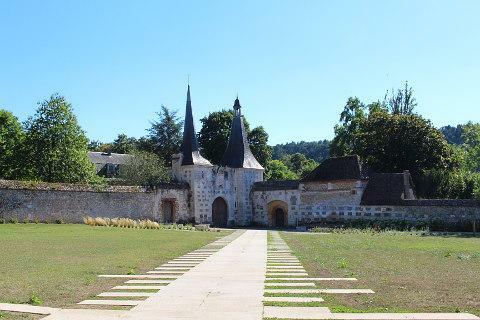 The monks left the Abbey during the French Revolution and in the following years the Abbey was used as a military stable, a stud, and a military depot. During the Second World War the Germans occupied the Abbey and it became a tank driving school! Allied bombings damaged the Abbey in August of 1944 and shortly after the Germans left. Villagers sheltered in the cellars of the Abbey. Following the war the Abbey was left empty and villagers used the stones for building. Eventually the monks were persuaded to return to the Abbey and a community of Benedictine monks remains to this day. Nearby a convent has been built for Benedictine nuns. 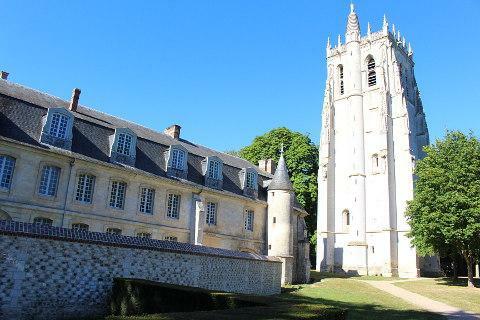 Enthusiasts of grand religious buildings will certainly want to also visit Lisieux, west of Le Bec-Hellouin, to see the impressive cathedral and other monuments, the imposing cathedral at Evreux, south-east of here, and the famous abbey at Jumieges to the north-east!